Summer collection, a photo by Cobra_11 on Flickr. I got a bunch of colourful strings yesterday and I immediately started making my summer collection of macrame bracelets. These four are all made in cobra-knot technique, but I'll make some bracelets with other techniques, too. Mr. Sparrow, a photo by Cobra_11 on Flickr. 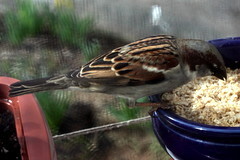 Lots of sparrows live in our garden, but they are notoriously hard to photograph. However, I finally managed to take a picture of one on the seed bowl on my window sill. 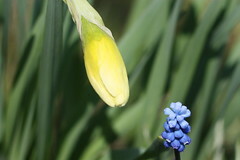 "Hello, Lady Hyacinth!" "Hello, Miss. Daffodil!" "Hello, Lady Hyacinth!" "Hello, Miss. Daffodil! ", a photo by Cobra_11 on Flickr. Braille art: Feel it, see it, a photo by Cobra_11 on Flickr. 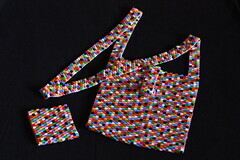 Hama beads bag and purse, a photo by Cobra_11 on Flickr. 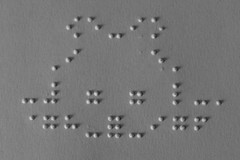 Easter Braille Art: Happy Easter Everyone! 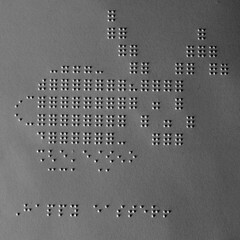 Easter Braille Art: Happy Easter Everyone!, a photo by Cobra_11 on Flickr. Peyote Bracelet, a photo by Cobra_11 on Flickr. 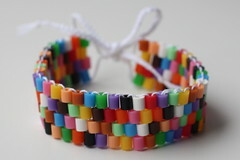 This is a bracelet I made yesterday. I used Hama beads and I sewed them together in peyote stitch. This is one of my favourite beading techniques. I learnt it when I was about ten years old. It's very easy to do, so it's the perfect technique for children to learn. Hama beads are great for this technique, because they stack up very well due to their shape. Peyote used with Hama beads is also a great introduction into beading for the visually impaired and blind people, since it's very easy to find the next bead you have to sew through: you only sew through those beads that "stick out" of the line. Triangles Bracelet, a photo by Cobra_11 on Flickr. 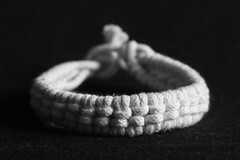 Double-lines bracelet, a photo by Cobra_11 on Flickr. 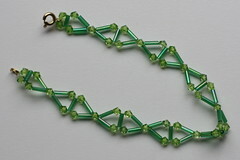 This is a bracelet I made yesterday. It took me about an hour and a half to make it. I'm especially proud of it because I figured out the pattern myself, without any instructions. 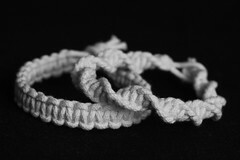 Although this kind of knotting is probably already out there, and tutorials about it probably exist already, I haven't seen them. I "invented" this myself and had lots of fun making it :-) The bracelet has a different pattern on each side, so it can be worn either way. 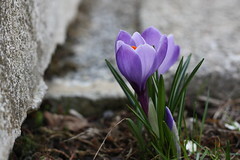 From our garden..., a photo by Cobra_11 on Flickr. 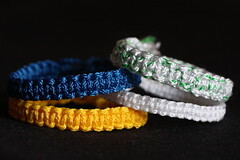 New macrame bracelets, a photo by Cobra_11 on Flickr. These two are actually just two ways of making the same knot, which is known as the cobra knot ;-) I only need about twenty minutes to finish one. Little Beauty, a photo by Cobra_11 on Flickr. 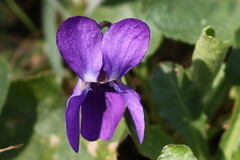 The lawn in our backyard is so full of these that it turns completely violet every spring! I'm a happy, optimistic girl of 27-something who likes good company, good food and good old laugh.